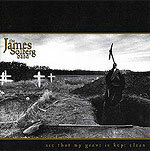 CD review: "See That My Grave Is Kept Clean"
This review first appeared in the November 17, 1995 issue of the North County Blade-Citizen (now North County Times). The James Solberg Band plays what can best be called existentialist blues  blues the way Albert Camus might have played them. It's dark, with a brooding quality about it, a surrealistic sense of hopelessness that is leavened only by the artistic beauty of the musicianship of a top-notch band performing deeply depressing compositions with vision and virtuosity. Solberg is a longtime veteran of Luther Allison's band, and the blues here is similar stylistically to that of his mentor: electric Chicago blues ranging from midtempo shuffles to out and out rockers that tear along at breakneck speed. Solberg is a first-rate guitarist; the combinations of his razor-sharp sound on guitar and H-Bomb Vegas' Hammond B-3 give the band a distinct sound. His raspy voice provides just the right complement to the instrumental work. The song selection  a handful of originals and covers of tunes by Allison, Junior Wells and soul star Latimer  is outstanding.